Pope Francis received the credential letters of Mario Juan Bosco Cayota Zappettini, the new ambassador of Uruguay to the Holy See. The meeting took place on Thursday in the Vatican’s Apostolic Palace. “That Christians, and other religious minorities in Asian countries, may be able to practice,” is the prayer intention of Pope Francis for January 2018, promoted throughout the world by the Pope’s Worldwide Prayer Network. Pope Francis on Thursday sent his condolences for the victims of a deadly bus crash along a coastal road in Peru. The Holy Father said he is “deeply saddened at the tragic news of the road traffic accident which occurred in Pasamayo”. He also offered “prayers for the eternal repose of the souls of the deceased”. His words of comfort came in the telegramme signed by Cardinal Secretary of State Pietro Parolin and sent through the Apostolic Nunciature in Peru. Pope Francis is scheduled to make an Apostolic Journey to Peru on 18-22 January. Pope Francis’ first international trip of the New Year will take place in less than two weeks. From January 15-18 the Holy Father will visit Chile, first stage of his itinerary, before going on to Peru, until the 22nd. To reduce the costs of the trip, Pope Francis requested that useless expenses be avoided, using recycled materials and goods, said the Executive Director of Pope Francis’ visit, Javier Peralta, to the Chilean newspaper T13. Therefore, the Pope’s request has been followed up, predisposing installations, such as altars, which can be used in other circumstances. According to T13, the altars alone will occupy a surface of 4,500 square meters; 600,000 hosts will be prepared for the faithful’s Communion. The costs of the visit will be shared between the Catholic Church and the Chilean State, which will be in charge of the financial burdens for the Holy Father’s safety and the Pontiff’s meetings with the Authorities. T13 reported that the total expenses foreseen will amount to four million pesos, 42% for the events in Santiago, 28% for the Mass at Iquique, 22% for the visit to Temuco, 5% for stipends and 3% for structural costs. Eventual surpluses will be donated to non-profit organizations that aid immigrants. Caritas-Chile and the Vatican selected the beneficiaries. Pope Francis on Friday welcomed Lebanon’s new ambassador to the Holy See, Antonio Raymond Andary. At a formal ceremony in the Vatican, the 63-year old diplomat presented his credentials to the Pope at the start of his mission. A father of three, Mr. Andary was born at Knaywer on 9 April 1954. After attending primary and secondary school with the Carmelite Fathers of Tripoli in northern Lebanon, he graduated in political science (University of Texas–Pan American, Edinburg, US, 1981). He then obtained a Master’s degree in international relations (American University, Washington D.C., US, 1985). Mr. Andary has held numerous conferences at cultural, university and social institutions on Lebanon, its culture and political system, and Christians of the East. The Pope began by urging all teachers to promote a culture of encounter, whether they work in Catholic schools or within the state system. The challenge, he said, is to educate children to be open and interested in other people, respecting their different histories, their strengths and weaknesses, their resources and limitations. Rather than becoming school bullies, he insisted, children must learn to be free of the prejudices stemming from a culture that is competitive and aggressive towards others, especially foreigners or anyone seen as an obstacle to personal achievement. The Palidoro Bambino Gesù Children's Hospital, a 120-bed facility, is one of the three branches of the main hospital in ‎Rome, close to the Vatican. The other hospitals are in St. Paul Outside the walls in Rome and at Santa ‎Marinella, on the seaside, further up north beyond Palidoro. Pope Francis on Saturday held out the Magi as models, urging Christians to dare and look up to the star and “set out”, shaking off their comforts, to “give freely” and “do good” to “the least” of the “brothers and sisters” of Jesus. The Pope’s exhortation came in his homily at a morning Mass in Rome’s St. Peter’s Basilica on the solemn feast of the Epiphany. The Jan. 6th feast of the Epiphany, a holiday in the Vatican and Italy, commemorates the visit of the ‎Three Magi, or Wise Men from the East, who followed a star to find the Baby Jesus ‎in Bethlehem, an ‎event that symbolizes the manifestation of God, made man, to the people of the world outside the ‎chosen ‎people of Israel. Taking his cue from St Matthew’s description of the Magi and how they followed the star in search of the newborn king, Pope Francis focused on three attitudes which characterize the Epiphany, or “manifestation” of Jesus: “careful searching, indifference, fear”. It is the Magi who, even after their long journey, continue their “careful search” for the Messiah. The scribes and chief priests, who know perfectly well where Jesus has been born, are “indifferent” to that birth and stay within their comfort zones. Herod, according to Pope Francis, has the worst reaction of all: “fear”. He is afraid the Child will usurp his authority and pretends to want to pay Him homage only because he wants to eliminate Him. “See how fear generates hypocrisy”, added Pope Francis in an off-script remark. It was a celebration of contrasts: the stern gaze of Michelangelo’s “Last Judgment” staring down at the bustle of babies that on Sunday morning transformed the Sistine Chapel into a make-shift nursery. And then the somber voices of the Pontifical Choir chanting in counterpoint to the gurgles and cries of the infants. Pope Francis appeared to enjoy every minute of it, blessing each of the 18 baby girls and 16 boys in turn, and personally administering the Sacrament of Baptism on all of them. This Sunday marks the feast day that recalls Jesus’ baptism in the River Jordan. Instead of delivering a scripted homily, the Pope chose to speak briefly off the cuff. In Italian, he used the word “dialect” to describe the “language” that needs to be used to guarantee the transmission of the Faith within the Family. Pope Francis has invited all Christians to mark the date of their Baptism and to celebrate it as the day when the Lord gave them the Holy Spirit to guide them in their lives. The Pope was addressing the crowds gathered in St. Peter’s Square for the Sunday Angelus immediately after having baptized 34 babies in the Sistine Chapel, an annual event that marks the feast day of Jesus’ Baptism in the River Jordan. Reminding those present that today’s celebration of the Baptism of the Lord concludes the time of Christmas, the Pope said it invites us to think about our own Baptism. All Christians should take note of the date of their own Baptism. VATICAN CITY (CNS) -- Because everyone has a right to life, liberty and personal security, nations must find nonviolent solutions to conflict and difficulties, Pope Francis said. Given the urgent need to favor dialogue and diplomacy in conflict resolution and to end the stockpiling of weapons, "I would therefore like to encourage a serene and wide-ranging debate on the subject, one that avoids polarizing the international community on such a sensitive issue," the pope said. 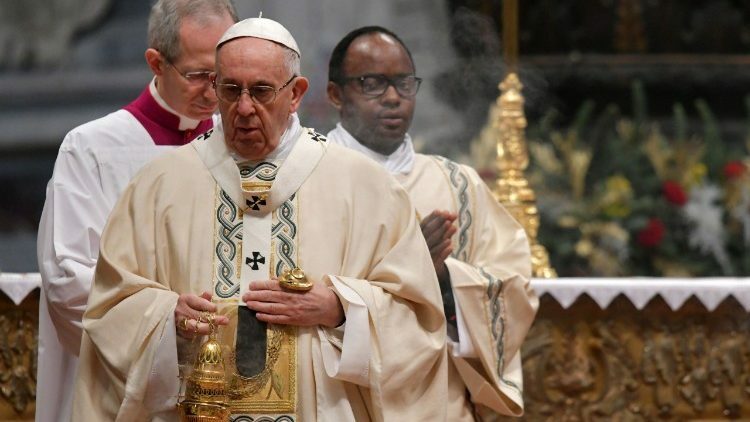 The conclusion of the Week of Prayer for Christian Unity in January and the start of Lent in February are among the major celebrations of Pope Francis in Rome after he returns from his Apostolic Journey to Chile and Peru this month. Monsignor Guido Marini, the Master of the Liturgical Celebrations of the Supreme Pontiff on Monday released the Pope’s schedule for January and February. Pope Francis is visiting Chile and Peru from 15 to 22 January 2018. The Vatican Secretariat for Communication releases a communiqué detailing recent restructuring efforts on social media channels under the recently-presented Vatican News logo. A community that exceeds 4 million users on Facebook, Twitter, YouTube and Instagram. This is the latest result of the reorganization of the social media channels of the Vatican Secretariat for Communication, unified under the recently presented Vatican News logo. One of the highlights of Pope Francis' upcoming apostolic visit to Peru is represented by a meeting with indigenous peoples of the Amazon rainforest in the city of Maldonado. Pope Francis’ upcoming visit to the Peruvian city of Puerto Maldonado will undoubtedly give visibility and voice to the indigenous people of the Amazon. In an interview published by the Pan-Amazonian Church Network – Repam – Fr Manuel Jesus Romero of the Apostolic Vicariate of Puerto Maldonado said the Amazon’s indigenous people have an urgent need to make their rights known as they are increasingly pushed from their ancestral lands. “Their territory is increasingly being invaded, their space is becoming smaller and smaller; the livelihoods with which they have survived for so many centuries are being destroyed: fishing, hunting, trees and rivers are more and more in danger. Therefore their lives are in danger” he said. Pope Francis’ arrival in the city of Puerto Maldonado, a symbol of Peru's Amazon indigenous communities, is scheduled to take place on 19 January. Here the Pope will receive representatives of different Amazon communities who will be able to voice their concerns and listen to the Pope’s message of hope and encouragement. Pope Francis offers the joy of a night at the circus to Rome's poor through the Papal Almoner, taking the opportunity to provide the services of health care professionals to those in need. Those who live on the existential peripheries of Rome are to be treated to a special “Circus of Solidarity”, thanks to the generosity of Pope Francis. The Holy Father is offering a ticket for a fun-filled evening to more than 2,000 of Rome’s poor or homeless people, several refugees, a group of prisoners, and many families in great need. The event will take place on the evening of Thursday, 11 January at the Medrano Circus in Rome’s northern Saxa Rubra district. The Papal Almoner released a press statement on Wednesday containing details of the event. Not content with offering just an evening of fun, Archbishop Konrad Krajewski said Pope Francis’ generosity is also providing a “sack supper” and medical personnel.